Cast members of UW-Waukesha's "Too Much Light Makes the Baby Go Blind - 30 plays in 60 seconds" create a wide variety of unique personas as they prepare for the show. Pictured, from left, are, back, Jordan Burac, Jake Schumberg, Kaitlyn Downing, Rachel Verhoef, Kyla Morey, Margot Lange, middle, David Hein Tammy Rice-Bailey, Ben Gienke, front, Karlee Berna. When was the last time you went to a play at which performers handed out free tacos to the audience, took selfies with audience members and invited audience members to come on stage and collect dollar bills? Probably never. 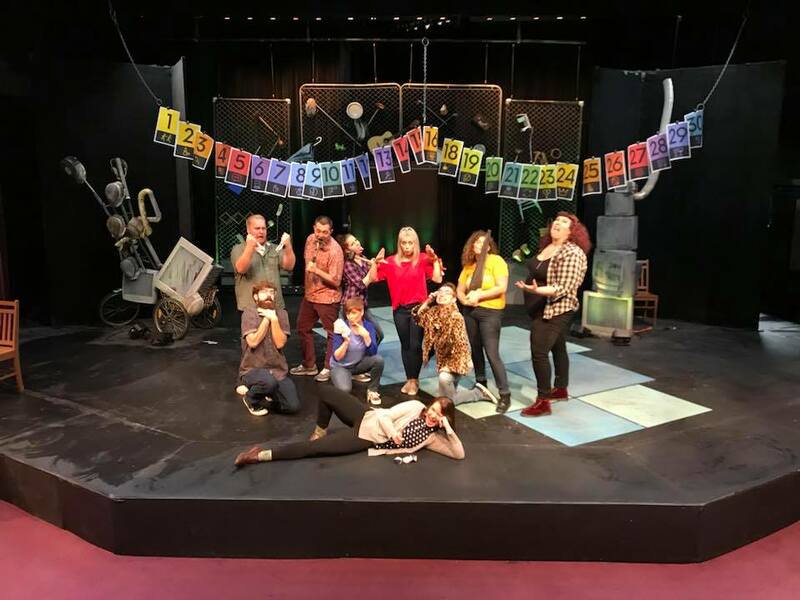 And that’s why the University of Wisconsin-Waukesha Lunt-Fontanne Ensemble’s latest show, “Too Much Light Makes the Baby Go Blind: 30 plays, 60 minutes,” is so much fun. The show directed by Steven Decker, is like no other theatrical experience. And it’s billing -- “30 plays in 60 minutes” -- is not false advertising. At least it would get a “mostly true” on PolitiFact. What makes it even more fun is the audience interaction. Large cards with the numbers 1 through 30 are hung on a clothesline across the back of the stage. Before each two-minute playlet, audience members get a chance to shout out the number they want performed. Each playlet is named, by number, in the program. Created by an ensemble called The Neo-Futurists, the show originated in 1988 in Chicago. All the performers play themselves on the stage, creating all sorts of scenarios that may reflect daily life in a humorous way, make a politically bold statement, contain satire or just an abstract thought. Sometimes audience members are included. The name of the show -- “Too Much Light Makes the Baby Go Blind” -- comes from the Chicago ensemble’s founder, Greg Allen. The words were spoken by an autistic child who liked to break light bulbs. The first number called out to be performed at the Oct. 14 show was No. 25, The Littles. Kaitlyn Downing dashed on stage and performed the skit that ran way under two minutes. A timer visible to most audience members makes sure each playlet stays under two minutes. This is a perfect play for college kids with the mandatory high energy needed to pull it off, which this troupe does nicely. The small bits range from a short, simple Sound and Fury (No. 15), featuring one performer, to a tricky bit of prose in Writing As It Is Being Written (No. 6) with a larger group. The ensemble consists of 10 performers, whose likenesses are included in the cleverly designed program, along with the sketch numbers they perform in. Performers, besides Downing, include Karlee Berna, Jordan Burac, Ben Gienke, David Hein, Margot Lange, Kyla Morey, Tammy Rice-Bailey, Jake Schaumberg and Rachel Verhoef. The skits are an eclectic grab bag ranging from silly, as in Burac’s performance of A Pair of Socks (No. 8), to thought-provoking in a piece called Memorial Day (No. 10) that makes a dramatic statement about guns. There is a clever five-act rendition of “Macbeth” (No. 3), as well as Lange’s pithy little ode to the hand in Prestidigitation (No. 7). One of my favorites was Masterpieces of the Lyric Form (No. 16), in which Verhoef interviews Burac and Lange about a raunchy rap tune, their seriousness and thoughtful interpretations creating a layer of humor as they discuss the tacky lyrics. Schaumberg rattles off a whole litany of self-flagellations as he apologizes for a bad date in The Apology (No. 19), his metaphors for how low he feels getting more disgusting and animated as he nears the two-minute mark. The guys – Gienke, Hein, Burac and Schaumberg -- have fun with It’s a Breeze (No. 24), in which they talk about the perks of being white, male and straight in America. In Manifest Destiny (No. 4), Rice-Bailey gives dollars away to audience members – but there is a price to pay in this clever bit. This is a perfect piece of theater for a generation growing up in an age of 140-line manifestos, emojis and Snap Chat. This show does not sit still. It is ephemeral – scenes bloom and grow and die, making way for something new and fresh. This cast seemed to have a ball doing the show, which is the ultimate test of teamwork. With their enthusiasm for the piece, the audience was fully engaged. For any high school or college student who hasn’t seen a live show, this would be a perfect place to start. The show added another feather in the gloriously plumaged cap of Decker, who once again has found a unique evening of theater for UW-Waukesha to perform and the community to enjoy.